New downtown design studio takes in the best of Harrisburg. Harrisburg today is a lively mix of old and new, full of architectural wonders and high-tech opportunities. The city has gone from being named the second-most distressed city by the federal government in 1981 to Forbes’ list of Most Livable Cities in 2010. We love it here. Red Privet has set up our design studio in the historic Harrisburg Train Station, we couldn’t be happier. We are conveniently nearby Harrisburg University, the State Capitol Complex and surrounding agencies and hundreds of businesses. Not to mention, some fabulous places to grab lunch – El Sol on Third Street has become a particular favorite. We have moved in next door to TECHQuest PA, an organization dedicated to growing technology business in Pennsylvania, who sublet us space on the second floor. TECHQuest sponsors regular events for technology professionals to meet and share ideas on solving common challenges facing Central Pennsylvania businesses. Getting our own design studio really means something to us. It’s not just collaborative design space; it’s a sign that our core philosophy – our customers’ success is everything – works. This focus on results and the belief that online products should make the people using them happy has led to solid results for us, but more importantly for our clients. We’ve been fortunate to partner with great clients throughout the region. We’ve team up with Highmark and United Concordia to deliver a customer-centric suite of online products and services and have had engagements with the likes of Armstrong World Industries and Versatile Systems. 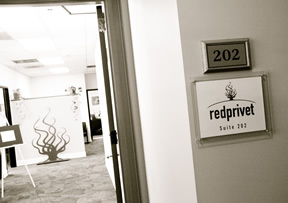 Red Privet is encouraged by the opportunities Central Pennsylvania businesses have to offer. We came on the scene in 2009 when the economic landscape was bleak, but have grown rapidly from just two employees to eight full-time experience designers and developers. We plan to keep partnering with high level clients to create easy-to-use online and mobile products and experiences that meet both the goals of our clients and their customers.